PLANO, Texas--(BUSINESS WIRE)--May 15, 2018-- Cinemark Holdings, Inc. (NYSE: CNK), one of the world’s largest motion picture exhibitors, announced its annual Summer Movie Clubhouse movie series, featuring some of Hollywood’s best family-friendly films, will return to theatres for only $1 per person beginning in May 2018. Cinemark will also offer a ten-week Summer Movie Clubhouse series card that allows guests to see all ten movies for only $5 per person and take advantage of discounted concession deals all summer long. Series cards are available at participating theatre box offices while supplies last. 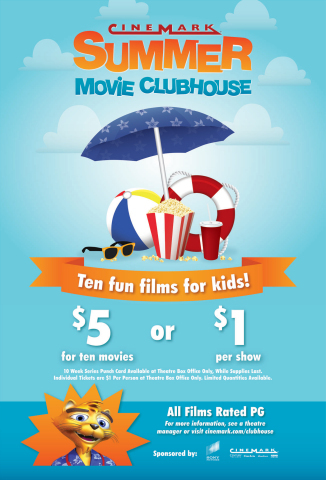 Summer Movie Clubhouse movie tickets and participating location information is available at https://www.cinemark.com/clubhouse. Though Summer Movie Clubhouse is one of the most popular programs of the summer season, moviegoers can get the best value all year long through Cinemark Movie Club, the monthly in-theatre membership program for $8.99 per month. Cinemark also offers a variety of discounts in select locations, such as early bird pricing for the first matinee show time of the day and discount pricing for seniors, students and military personnel. Visit https://www.cinemark.com/clubhouse for specific information about participating Cinemark locations, movie titles and show time schedules.